GRAPELAND – The May 6 election is just around the corner and the Grapeland ISD Board of Trustees is trying to ensure Grapeland area residents have all the facts about a $7.75 million bond initiative they will be asked to vote for. 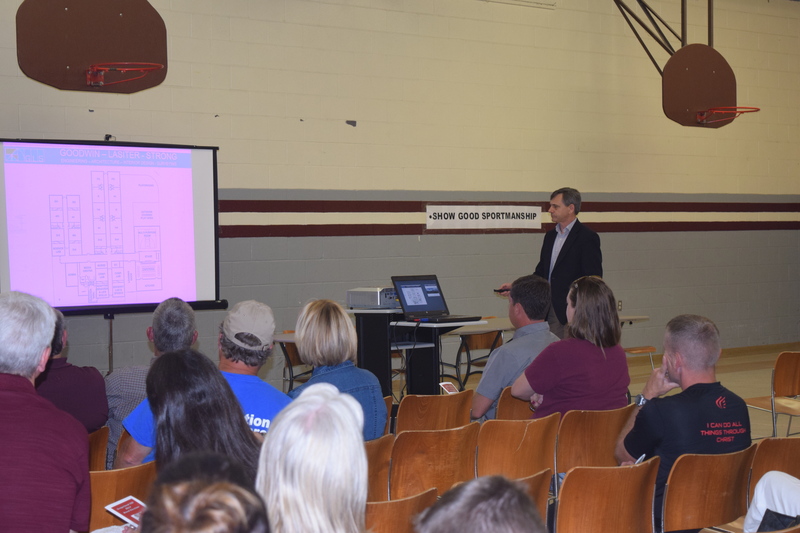 As a part of the process, the GISD Board held a called meeting at the elementary school to provide the public with information and answer any questions the local citizenry might have. The meeting was opened by Board President Eddie Childress who welcomed those in attendance and introduced Mark Strong with the architectural firm of Goodwin, Lasiter, Strong as well as Steven Berry with the construction firm of Berry and Clay. “As you know, we are going to put before the voters a bond proposal for $7.75 million. I would also like to make a couple of announcements. April 24 through May 2 is the timeframe for early voting. Mr. Strong and Mr. Berry are here to answer any questions you might have and we, as a board, would also be happy to answer any of those questions. There is not a bad question,” Childress said. After the introductions, Childress turned the floor over to Strong. Strong described the entryway of the proposed elementary and said there would be a secured vestibule as soon a person entered the facility. “Any parent or visitor that comes to the campus would have to check in at the front office before they could have access to any other parts of the building. The great thing about this – whether it is the classrooms, the computer labs or multifunctional areas – no student has to go outside to access any of those areas. Everything is under one roof,” he said. The architect described the different areas of the design and explained how everything shown in the drawings was in compliance with the standards set forth by the Texas Education Agency. “We met with the elementary teachers and staff here on the elementary campus and we received some great input from them. We really appreciated that and we plan to incorporate their ideas into the plan. The building is roughly 44,800 square feet and I believe it is a good well-functioning design,” he added. At the conclusion of Strong’s remarks, GISD Superintendent Greg Spivey addressed the audience. The superintendent explained Grapeland ISD taxpayers 65 years of age or older who have applie d for and received their age 65 freeze will not pay an amount of school taxes above their frozen level, even with a successful bond election. The freeze is for the homestead only, he explained. Any additional acreage or improvements made to the property after the bond election would be subject to the new tax rate. 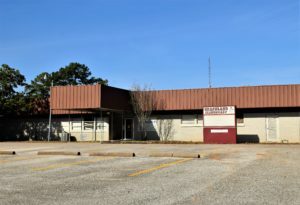 As to what was included in the bond package, Spivey said the bond package would consist of the construction and associated costs of the new elementary building only. “It does not include the construction of any athletic fields, no new busses and there are no improvements to the auditorium. It is just focused on the elementary school itself,” he said. “The total cost of the bond is $7.75 million. Of this amount $6.75 million will be for the building itself and $1 million will be for soft costs such as architecture fees, builder fees, furniture, fixtures and equipment,” Spivey said. The superintendent also discussed how the passage of the new bond would impact how much money taxpayers would be expected to pay. Spivey walked the audience through various scenarios based on the appraised value of a person’s property. According to Spivey, the Houston County Appraisal District had informed him the average property value of a home in the district was appraised at $55,320. Using this number, the superintendent explained when the $25,000 homestead exemption was subtracted from appraised value, the taxable value of said property was calculated at $30,320. If the bond were to pass, the superintendent said the maximum annual tax impact for this property would be $70.43 or $5.87 per month. For a $70,000 home, the maximum annual tax impact would be $104.39 or $8.70 per month. For a $100,000 home, the maximum annual tax impact would be $173.98 or $14.50 per month. For a $125,000 home, the maximum annual tax impact would be $231.97 or $19.33 per month. For a $150,000 home, the maximum annual tax impact would be $289.97 or $24.16 per month. When the superintendent concluded his presentation, a concern about the spread of false information – as it pertained to the bond – was addressed. “I have been informed that someone who has a big voice in the community is putting out false stories and saying that this bond includes a baseball field and that basically, the school is lying to everyone,” an audience member said. Childress further explained the issue swirling around the baseball field. “If they would come to our board meetings they would know about this. We are going to have a new baseball field. That is where the new elementary school is going to be built. There are two reasons for this. One is we own the property and we don’t want to spend any more money than we have to. The second reason is we have been talking for years about moving the baseball field out to where the other sports complexes are,” he said. He added the board had decided in their February meeting to move the baseball field regardless of what happened with the bond. “If it passes, wonderful. If it doesn’t pass, we are still going to build a new baseball complex. We are going to take funds out of our fund balance initially to get started. Then, we have made a commitment starting next year to budget funds to do improvements – every year – until we get finished. Eventually, the baseball complex will be completed out of or budget, budgeted funds. We are going to do that regardless of what happens with the bond,” he said.